Over the centuries, Eastern Orthodoxy became the dominant expression of the Christian Apostolic Faith in Greece, Russia and the Russian Territories, the Balkans, Serbia, Bulgaria and Romania, and the Oriental Orthodox Churches in the Middle East, this would include, the Armenian, the Coptic and the Ethiopian Orthodox Churches. All these Orthodox Churches are independent of each other, each with its own Synod and/or hierarchy, including a primate who is called, depending on culture and history, Patriarch, Catholicos, Pope, Metropolitan or Archbishop. All of these churches espoused generally the same Holy Traditions (teachings) and Holy Mysteries (sacraments) and Apostolic heritage of the undivided Church. They all acknowledge the Patriarch of Constantinople as Primus Inter Pares (first among equals among the independent sees) following the schism with the West. Orthodoxy, therefore, is divided in language, national politics, and old-country loyalties However, Orthodoxy is also united in faith, theology and for the most part, worship. The Holy Eastern Orthodox Catholic and Apostolic Church in North America ® is the indigenous and autocephalous Orthodox Church for all of North America. Founded in 1927 by the Synod of Bishops of the Russian Orthodox Church in North America. Although we offer filial and brotherly ties to the Holy Patriarchate of Moscow and All Russia, and all canonical and ethnic Orthodox Churches, which have been spurned, we are the canonical Orthodox Church for all North Americans. The first of the Orthodox Churches of the East to bring the message of Orthodoxy to North America was the venerable Russian Orthodox Church. In 1794, eight monks from a Russian monastery founded an Orthodox mission on Kodiak Island, which then belonged, together with all the lands of Alaska, to Russia. By 1840, a Russian Orthodox Bishop had been consecrated for the lands in Alaska. In 1872, his seat of authority was moved to San Francisco, and, in 1905, the Russian Orthodox Church moved its Diocesan and administrative headquarters to New York City. In 1905, the American Archbishop Tikhon presented to the Russian Synod of Bishops the project of an autonomous, or autocephalous, Church of America, whose structure would reflect the ethnic pluralism of its membership. He also foresaw the inevitable Americanization of his flock and encouraged the translation of the liturgy into English. The will of Patriarch Tikhon was also expressed again in 1921 towards the foundation of the same ecclesiastical body. On August 14, 1921, Patriarch Gregory of Antioch wrote to Patriarch Tikhon of Moscow, submitting a proposal to establish his Antiochian jurisdiction in America. However, the Russian Patriarch (who had served as Archbishop of America prior to the Russian Revolution) stated in his reply dated January 17, 1922, "the 'Russy - Antaki' conflict must be resolved with the approval of the Russian authorities in the New World and their supporter Aftimios Ofiesh". In other words, the Patriarch of Antioch must first obtain permission of the Russian Orthodox Bishops in North America including Bishop Aftimios before the 'Antiochians' could establish their jurisdictions. 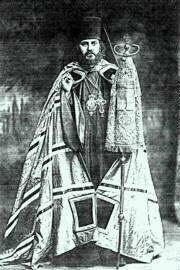 In 1922, Metropolitan Platon (Rozhdestvensky) assumed leadership over the Russian Orthodox Church in North America. Metropolitan Platon was appointed by Patriarch (Saint) Tikhon of Moscow and All Russia. In 1923, Metropolitan Platon, with the approval of Patriarch Tikhon, elevated Bishop Aftimios (Ofiesh) to Archbishop. "Now we, the Synod of Bishops of the Dioceses of the American Russian Jurisdiction, believing ourselves called of Christ and moved of the Holy Spirit in behalf of Holy Church and Her children in the Americas and being fully authorized through the above letter by the highest Authority in the Church to which we owe and maintain strict obedient loyalty." A brief description of the letter mentioned above would be useful at this point. The letter referred to is one written by Metropolitan Sergius, Acting Patriarchal Locum Tenens of the Russian Orthodox Church, under the date of September 12, 1926 (new style) addressed to the Russian Bishops outside of Russia and of which the excerpt was felt to be relevant to the founding of the new American Orthodox Catholic Church. In countries which are not Orthodox, autonomous groups, even Churches, could be organized, whose members need not all be all Russians. Such separate and individual life can sooner save you misunderstandings and friction that an effort on the part of all to stay together under the authority of an artificially created center. The Synod of Bishops of the Russian Orthodox Church in North America stated: "we hereby, on this 2nd day of February (new style) in the year 1927, charge one of our number, His Eminence, the Most Reverend Aftimios, Archbishop of Brooklyn and we do hereby permit, empower, authorize the said Archbishop of Brooklyn to found, organize, establish, head, conduct, control and maintain a distinct, independent, and autonomous branch of the Orthodox Catholic Church to be known and legally established and generally recognized as The Holy Eastern Orthodox Catholic and Apostolic Church in North America". Statement #2 stated that: "it is derived from and canonically founded by the Church of Russia and while The Holy Eastern Orthodox Catholic and Apostolic Church in North America is entirely autonomous and independent in its organization, constitution, administration, jurisdiction and authority, it shall preserve at all times its brotherly and filial relationship to the Patriarchate of Moscow and All Russia". Our completed Constitution was dated December 1, 1927 and stated: "that The Holy Eastern Orthodox Catholic and Apostolic Church in North America is independent (autocephalous) and autonomous in its authority in the same extent as the Orthodox Patriarchates of the East and the Autocephalous Orthodox Churches now existing." "Furthermore, The Holy Eastern Orthodox Catholic and Apostolic Church in North America has original and primary jurisdiction in its own name and right over all Orthodox Catholic Christians of the Eastern Churches and Rite residing or visiting in the U.S. and Alaska and the other territories of the U.S., in Canada, Mexico and all North America". Tragically, the Orthodox Church in the New World has suffered, since 1927, from chronic disunity. We do not participate in the squabbling among Ethnic and Independent Orthodox jurisdictions in the disputes usually based on claims of 'canonicity', 'authenticity' and 'official recognition'. We do occasionally get forced into some disputes that involve independents claiming to be us. Such fraternal disputes are scandalous to the people of God and destructive to Holy Church, and we simply, yet firmly, refuse to join into the fray. We do however defend our Registered tradename and logo (Trademark) by any and all legal means open to us since many in the various independent jurisdictions attempt to claim they are us or are canonical and in our lines of Apostolic Succession. It is very important to note that "the Russian branch of the Orthodox Catholic Church has the oldest and most numerous establishment of Orthodox Catholic faithful and churches in America and by reasons of its first evangelization of America natives and its century of sole Orthodox mission hierarchy in America, it is canonically responsible for the care and development of, as well as authority over, Orthodoxy in America". This is a direct quote from the statement of the Council of Bishops at their founding of The Holy Eastern Orthodox Catholic and Apostolic Church in North America on February 2, 1927. Archbishop Aftimios was a true visionary. He had the heart of a missionary; and he (like Patriarch Tikhon before him) perceived the absolute essentiality of establishing a native American Church. 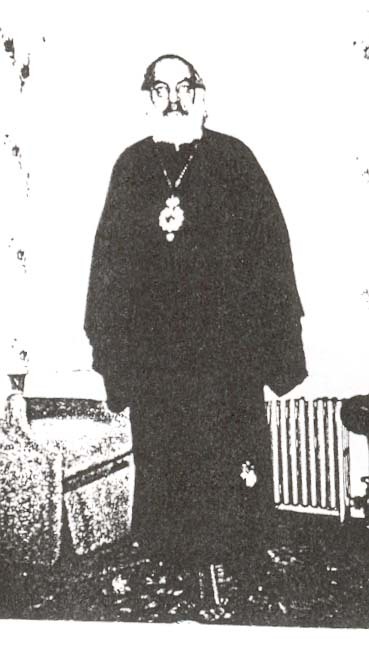 On February 2, 1927, Archbishop Aftimios became the first Ruling Hierarch of the Church when Metropolitan Platon and the Synod of Bishops of the American Russian Orthodox Dioceses, meeting in South Canaan, Pennsylvania, carried out the will of Saint Tikhon, Patriarch of Moscow and All Russia and chartered as an autocephalous American Orthodox Catholic Church "The Holy Eastern Orthodox Catholic and Apostolic Church in North America" under Archbishop Aftimios was established and incorporated on the basis of an excellent Constitution, designed to bring true unity to American Orthodoxy. Many believe that Archbishop Aftimios and his successors have been the only canonical Orthodox bishops in the United States since 1917. Archbishop Aftimios died at age 85 in 1966. His heritage lives on in the Church he headed from 1927 and incorporated in 1928. 3) he had been ruling hierarch of the North American Diocese from 1907 to 1917 and therefore was personally known to a majority of clergy and to very many of the lay people. Jursidictional Divisions in the U.S.However, it was and is these old-country loyalties which have created the ethnic divisions and administrative struggles between various Orthodox jurisdictional church groups - which have so complicated and often crippled the Orthodox Church's development and growth in this country. Orthodoxy in America today is divided into more than 24 different groups/jurisdictions. Some are under old-country jurisdictions; others are self-governing and "independent" of all foreign ties. Metropolitan Victor was elected by the North American Holy Synod in Feb. 1997 to follow Abp. Aftimios of Blessed Memory as Presiding Bishop of this Church. The Synod later determined to change the title from Archbishop President to Metropolitan. In July, 2003 the Synod declared THEOCACNA to be the American Orthodox Patriarchate. The name "The Holy Eastern Orthodox Catholic and Apostolic Church in North America and logo used by this Church is the Registered Service Mark of the Church.